a storm trysail for the Wayfarer! The trysail is a gale force/storm survival sail normally used by keelboats in severe open ocean conditions, where W-survival, Frank Dye style, is: drogue out, lower mast and prepare for bailing and rollover! On W1348, the trysail came into use back in 1968 after reading Heavy Weather Sailing by K. Adlard Coles. Last time used by me in heavy weather, F7 - F8 (14 to 18 m/sec), some years back (1996), eastbound from Cape Lindesnes (southernmost Norway) to Kristiansand. Pursued by heavy weather, two W’s found shelter in Mandal - to await improvement. On the third day, we proceeded under deep-reefed mainsail only. My crew had to leave at Mandal, so the single-handed work for me was arduous through wild gusts and extremely exhilarating planing - too much brinkmanship, greatly reducing pleasure to hard work! This went on for about three hours. Then we stopped for a lunch break in the lee and warm sun of the most lovely one of little coves being well protected by high rocks (100 ft), bushes and trees. Right there on this wonderful little skerry isle, one of many hundreds, I felt, while climbing on to the rocks, quite worn out, and about as tall as my socks! After lunch, and a for me, rather short sunning rest, I sneaked down to W 1348 to make her trysail-ready. Well knowing that my progress would be slower, but surely safer, the intention was to leave the snoozing couple, Neel & Bo (W 2042), about ½ an hour early, hoping we should reach Kristiansand at the same time. It worked very well. At first, on a broad reach, good stable planing in the gusts, then coming close-hauled by Flekkeøy (øy = island) - just sit and steer, quite relaxed. Although the boat was knocked over on its beam-ends in the most powerful gusts, nearly ‘drinking’ water, it just kept going (weight well aft - rudder in the water, and no hard-down-kicked boom to grab the water and trip you into a capsize) and righted itself again as the gust eased. On the final part, tacking for our night port, W 2042 under small jib and deep-reefed mainsail, caught me - as wished/planned! W - Trysail: Your genoa is used. A “slider” about 2 inches long is sewn on by the top eyelet in front of the luff wire. Insert the “slider” into the sail track of the mast and hoist with the mainsail halliard; attach the Cunningham downhaul (4:1 purchase on W 1348) to the tack and stretch well down. The genoa sheets are taken back through an eyelet/fairlead on either side of the aft decks. On W1348 with three aboard and loaded for at least one week of cruising with two tents, food, beer, personal-, kitchen- and achoring-gear, oars, engine + 5 ltr. of gasoline a.m., there really was no need for W-trysail-cruising (which is the convenient and SAFETY-guarding manner for a solo-W-sailor). But we used the trysail for easy handling, the ability to heave to, not going too fast, and being able to turn back against the wind and waves to render assistance, without hoisting the mainsail, and I am still impressed how well the W-trysail works, even heading back into the waves. Two years ago, Gudtorm Heldal (W7172) and I sailed 11 hours non-stop from Larvik to Drammen, and used his W-trysail part of the way. He then showed me his idea of using the spinnaker boom between a small loop in the tack-eye of the W-trysail to a small loop in the sheet-eye making the sail a small boom+loose-footed main-sail - see photos below. I find his idea especially efficient on a broad reach, and on the run as it wings the sail better. My latest observation of week 30/2005 is as follows: The foot of my oldest genoa/W-trysail (which I'll give away) is actually about 5 inches too long for the spinnaker boom. My newest one, made like a medium genoa by McNamara is about 4 inches short which is no problem, and a third one is right on the 'money'. These two latter ones are made to fit/slide inside the groove of the mast. For trolling we often use W-trysail and possibly a partly furled/adjusted genoa for proper trolling-speed. 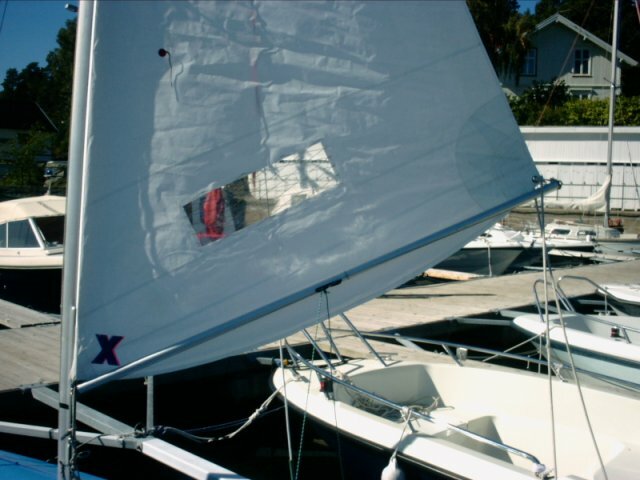 My W-trysail is now rolled/folded on an extra spinnaker-boom and stowed under the side-decks for easy access. 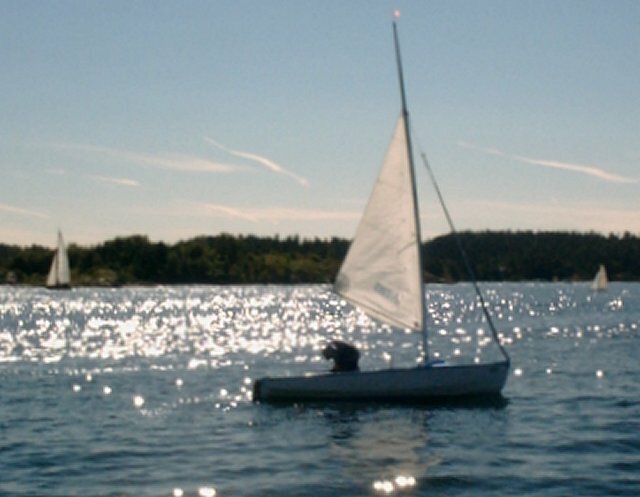 With the trysail, the risk of a capsize is reduced. It is easy to gybe and possible to tack and work to windward in some sea way (not possible with the genoa alone up front!). And the boat will stay hove to. Naturally, your boom and mainsail should be well tied down and the boat secured for rough sailing. About eight years ago, our Scand. Chairman, Poul Ammentorp, had a medium Genoa made by McNamara, UK, and this was a sail to my liking, so I had the same made for W1348 'Maitken' with a top that could slide into the slot/groove of the mast. This sail is now my permanent, ready-to-go W-trysail stoved on a spinnaker-pole under the side decks. It's shown on your W-trysail-file mentioned above. 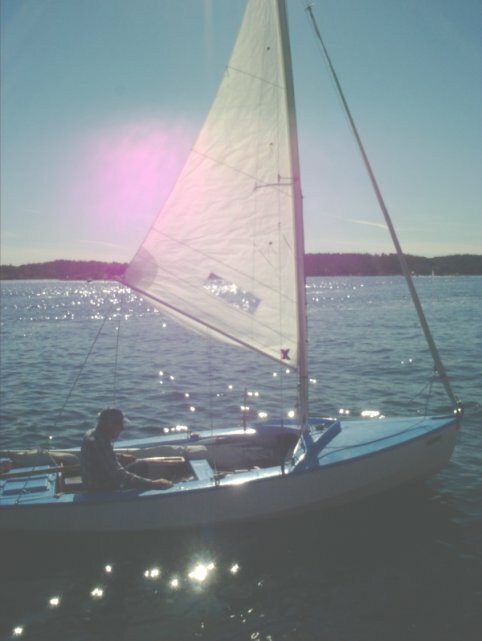 The W-trysail is a back up sail for safer cruising in gale-force winds. It has been used/tested in earnest during wind velocity of about 18-20 m/sec., but never close-hauled against heavy breaking seas(1 m+). It can be used on a reach/run together with the jib or genoa, the latter evt. partly furled/rolled for reasons of balance. I should have added control of speed is absolutely essential! Some 'wild planing' is possible under W-trysail. In my experience the W. does very well in rough conditions without a foresail - sailcentre aft of the mast! Please note an OL-FINN-dinghy has NO foresail ! So my conclusion is: Use no foresail OR test out one of a size that suits you ! Good luck and best W-wishes. Ken, W1348 Maitken. 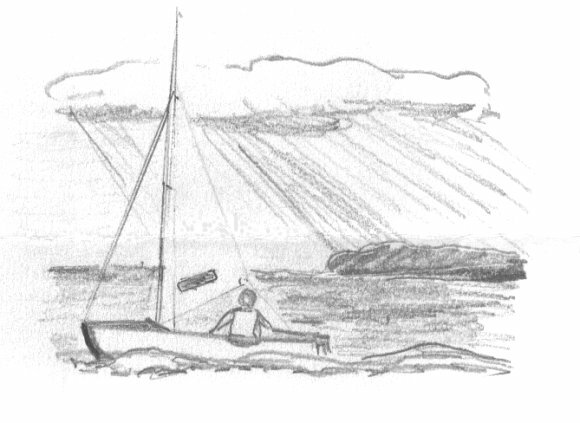 Hope this sketch answers your query: I use an ordinary W-class spinnaker boom. Now having two herof I leave my W-trysail furled on one of them, the one (Medium Genoa) made to slide into the mast-groove.. However two narrow loops, one in the tack eye and one in the sheet eye, will hook onto the ends of the spinn.pole so an ordinary W-genoa with the short foot-length OR a medium W-genoa can very quickly be fitted to the pole - if this is wanted! 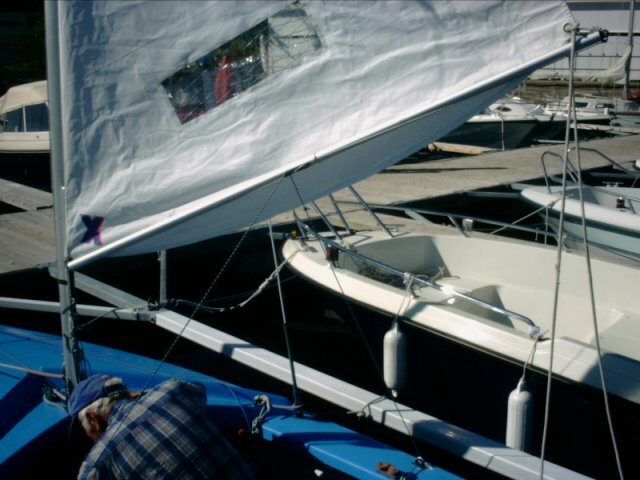 My older W-trysails were used for many years without a boom ! 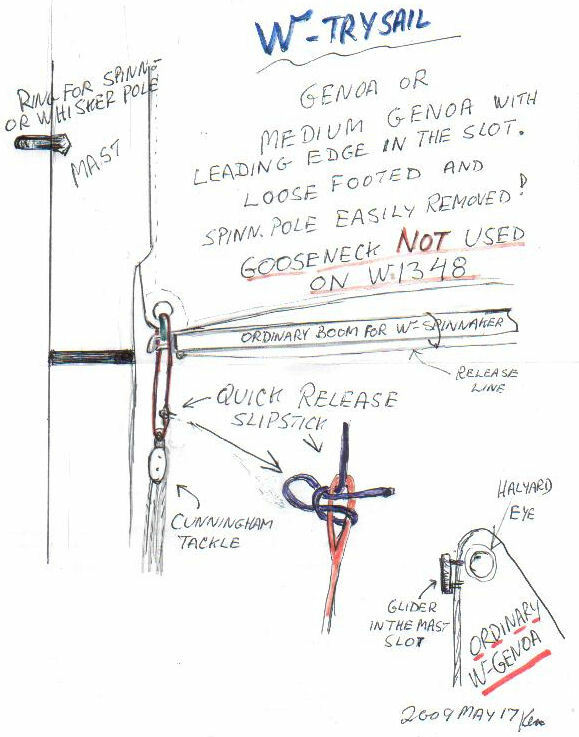 The gooseneck on W1348 is NOT used with the W-trysail-boom! If the Genoa-foot is too long for the spinn.pole it should be fairly easy to add a piece of plastic or glassfibre tube to the spinnaker pole. Best W-regards Ken W1348 "Maitken"